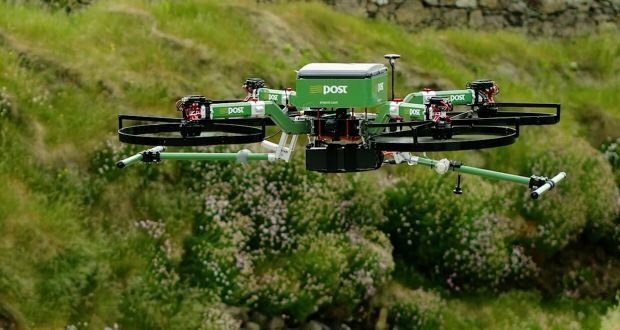 Can delivery drones be used in other areas besides home delivery? Are Cargo Container Stacking Drones (CCSDs) feasible? The benefits of automation – higher productivity, reduced cost and increased safety – are very alluring, particularly in places of very busy logistics activities such as railroad yards (or ports) where if something goes wrong during the handling and stacking of freight containers, they can become bottlenecks affecting the entire supply chain. Given that the transportation of containers by rail is significantly growing (particularly in places like China) there will be a need to further automatize and speed up the handling and stacking of freight containers in railyards. Automation of gantry cranes is already becoming commonplace, but how about the other transport agents such as reach stackers? Could a reach stacker be programmed to handle and stack containers autonomously? Taking it a step further, could drones do the trick? As mentioned in a previous post, drones can theoretically already deliver a 4,000 lb car to your driveway so why could they not theoretically deliver the 62,170 lb (28,200 kg) payload of 20-foot freight containers? What would it take to make these drones a reality? The basics of the technology needed do appear to already exist. Precise positioning systems would have to be integrated into these drones to help them measure dimensions and contours of the containers to be transported. Unmanned gantry cranes can position containers within +/- 50 mm. The technology already exists, so it would just be a matter of shrinking and integrating the technology into the container stacking drones. An ideal transport path would have to be calculated quickly in order to save time. Zurich is already developing land-based drones with highly accurate and efficient path calculations, not hard to imagine the technology being used for other applications. Automated detection of other vehicles, human personnel and objects in the vicinity of the area of operations would be required to maintain workplace safety. What are your thoughts on the unmanned cargo container stacking drone concept? Comment below! Hanjin would obviously need drones capable of removing cargo containers from its stranded ships.